Dragon Pays is a new Chinese-themed video slot from Novomatic and High Flyer Games. The game has five reels, each with three positions. You can play this game any way you like – it’s one of their most customisable games yet! Dragon Pays can be played with 5 paylines, 10 paylines, 20 paylines or 243 ways to win! Don’t forget, the more paylines you activate, the bigger your bet per spin will be. This Novomatic video slot is exciting to play – the sights, the sounds and the stupendous pays all come together to make a super thrilling slot experience! In Dragon Pays, you can win Free Games with win multipliers of up to x30! The Free Games also come with a great 2nd Chance Respin feature. Dragon Pays has golden coin Scatters and golden dragon Wilds! With a competitive RTP, Dragon Pays is a feast for the eyes as well as for the wallet! You can play it here for free or you can play it for real money. Don’t know which casino to choose? Read Novomatic Casino reviews on our site, written by our expert team, to help you decide on the perfect one. Other Novomatic slots that will be enjoyed by Dragon Pays fans include: Ninja’s Path, Dragon’s Wild Fire, Asian Attraction, Dancing Dragon and Katana. Before you play Dragon Pays for the first time, you can open the paytable. This explains all of the rules and also shows all of the payouts for the individual symbols. The great thing about Novomatic games (as opposed to slots from other developers) is that the paytable updates itself when you adjust your bet, so you can always view the exact payout figures that you’ll win. Every symbol in Dragon Pays has payouts for x3, x4 and x5 matches. Depending on which mode you’re playing in, these symbols will either have to land adjacently on a payline or just adjacently, starting from the leftmost reel. 9, 10, J, Q, K and A are the symbols with the smallest payouts. Bigger payouts come from the picture symbols. These are (in ascending order of value): the lotus flower, the firecrackers, the koi fish, the turtle and the pot of golden coins. The golden dragon Wild symbol will expand to fill the entire reel it lands on and it has the capability to fill in for any symbol as long as it contributes towards a win! 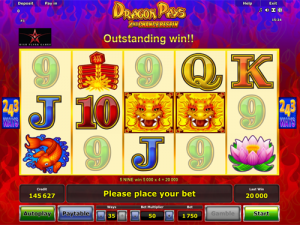 Dragon Pays is a video slot from Novomatic and, as such, it has Scatter symbols that can win you Free Games! As usual, you need to land 3 or more Scatters to trigger the Free Games. This Scatter symbol can’t be replaced by the dragon Wild. It pays from 3 matches, no matter whereabouts they land. When you’re playing in ‘243 ways to win’ mode, 3 or more Scatters also trigger the Free Games round. There are several different options you can choose from! These are: 18 Free Spins with win multipliers of x3, x5 or x8; 13 Free Spins with win multipliers of x5, x8 or x10; 10 Free Spins with win multipliers of x8, x10 or x15; or 8 Free Spins with win multipliers of x10, x15 or x30. Each has the same RTP, so it doesn’t matter which you choose! If you can’t make the decision yourself, you can choose the ‘Mystery’ option and the game will decide for you! During the Free Games, an extra feature comes into play and that’s the 2nd Chance Respin feature. For this feature, every time a golden dragon Wild symbol falls on the reels, it will expand to cover the whole reel (all three positions). If no wins are awarded, the other reels will spin again (while the dragon Wild stays in place), to give you a second chance at a win!